Read about basic volleyball rules that have been changed recently. You'll find simple and easy to understand rules for fans and players. The size and positions of a team. The size of the team varies in leagues, but most often team can have 12 players on the roster. One of the players is called a libero, defensive specialist who is wearing different color shirt. (Often in international tournaments and matches between the national teams a roster can include 14 players, 2 of them being liberos). The court is divided to front row and back row. 3 of the players are front row players and other 3 are back row players. Players rotate on the court clockwise - every time a team wins a rally after the opponent's serve. Players won't rotate after winning a point after own serve. Libero is a player who plays on the back court only. Libero wears a different color shirt. 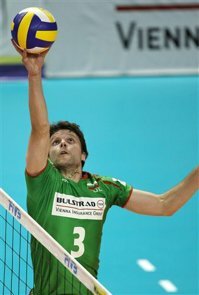 A libero - the player with different color jersey. International volleyball rules allow to use two liberos - i.e. other can be a defensive specialist and the other a serve reception specialist. A libero cannot serve as a captain, or team captain for the team. Notice that libero rules can vary between the leagues. Can volleyball libero attack the ball? A libero is NOT allowed to attack the ball (perform a swing above the net level). Notice that a libero is able to perform a swing, if the ball is below the net. One more time in other words: if the ball is completely above the net, a libero is not allowed to swing the ball over. It is LEGAL, but still a libero should not finger set the ball in the front row (inside 3 meter or 10 feet hitting line) because after the set other players are NOT ALLOWED to perform an attack. When a libero finger sets in the front row, it becomes a mistake if the attacking player hits the ball, which is completely above the net level. In other words, if a libero commits to a front row finger set, the next player is NOT ALLOWED to attack the ball above the net. Bump set of the libero is allowed anywhere. not serve by FIVB rules. A substitution is not needed when placing a libero to the court. 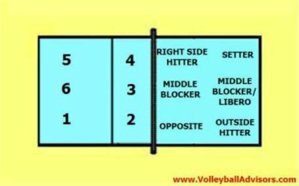 A libero can enter and exit the court between the rallies. When the libero exits the court, the libero needs to sit out one rally before entering in again. 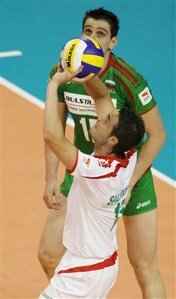 A libero is not able to serve the ball according to international rules. (Notice that some leagues in United States allow the libero to serve). Scoring according to international volleyball rules: each game is played until 25 points, except the fifth game which is played until 15 points. A team wins a match when it wins three games inside the match - the final score can be 3-0, 3-1 or 3-2. Often in smaller tournaments two winning games are required to win a match - the final score could be 2-0 or 2-1. Sometimes only two games are played in the tournament. Then match can end up a tie, 1-1. Next you find explanations to few rules which are hard to judge - even for referees. A double hit is actually ALLOWED in few situations. 1. It is important to notice that a double hit or even various contacts are ALLOWED on the first hit, i.e. on the defensive or serve reception play. (I.e. in serve reception when ball hits the player first to the arm and right after that to any part of the body). 2. On the overhand serve receive or defensive play double hit is also ALLOWED. 3. A double hit on the set is ILLEGAL. Rules of Volleyball that often cause confusion in the matches are situations in which the players play the ball above the net and reach over to the opponent's side. can be played by the both teams. These scenarios can be confusing and are difficult to judge. Often referees end up doing mistakes with these calls. IMPORTANT! If the ball breaks the plane of the net and the opponent's setter is setting the ball, the opponent is ALLOWED to play the ball. The reason for this is: when the ball is on the plane, the ball is there for both teams to play. In the last scenario if the setter is a back row player and both players touch the ball at the same time, the back row setter performs an ILLEGAL back row block. Try memorizing the following rules..
Related Pages - How to use rules to your advantage on the court? If you are interested to read more about how to use rules to win more points for the team, check out the following page. This page is made for the quick thinking player to score more points in the match. If the last few rules sound too confusing, explore the following basic rules pages.